Open Source Mobile Device Management? Any news abt MDM on Nethserver 7.6 ? With php-scl it should be possible to use php7 with glpi. It would be great to have a full blown MDM feature, especially in a BYOD environment. It is probably possible to use the specific port or the different tcp socket of mariadb scl :-? OMG, I tried to connect to localhost:3312 and that’s not possible, I didn’t read the wiki page carefully enough. With giving the glpi mariadb user access to server.domain.local the connection worked. I also updated the used PHP from 5.6 to 7.1. Please change server.domain.tld to fit your servername and SECRET to have a more secure password. Browse to https://NETHSERVER/glpi and go through the install. Enter server.domain.tld:3312 in the DB host field and the DB user credentials. Bareos - Backup Archiving REcovery? Thank you Markus, GLPI is installed… Can someone help me please, with the next steps for MDM ? Do we need Fusion Inventory also, or just Flyve MDM for GLPI ? Which user should I use? I guess apache? Yes, like here but the php path should be changed to use 7.1. I guess I have to install mosquitto via yum first. Is the rest of the commands OK? For the mysql commands you have to use mysql102 -e "..." as glpi doesn’t use the default mysql server. You don’t need the -h option. I think you have to replace gpli-database-name with glpi. [root@mdmsrv01 ~]# mysql102 mdmsrv01.mydomain.lan -u mosquitto -p -e "select * from \`glpi\`.\`glpi_plugin_flyvemdm_mqttusers\`;"
What abt the port 3312 ? I assume you have everything on one Nethserver or do you run mosquito and glpi on different servers? The command mysql102 uses the right mariadb102 so you don’t have to care about the port. Did you enter the correct password for mosquito you set before? 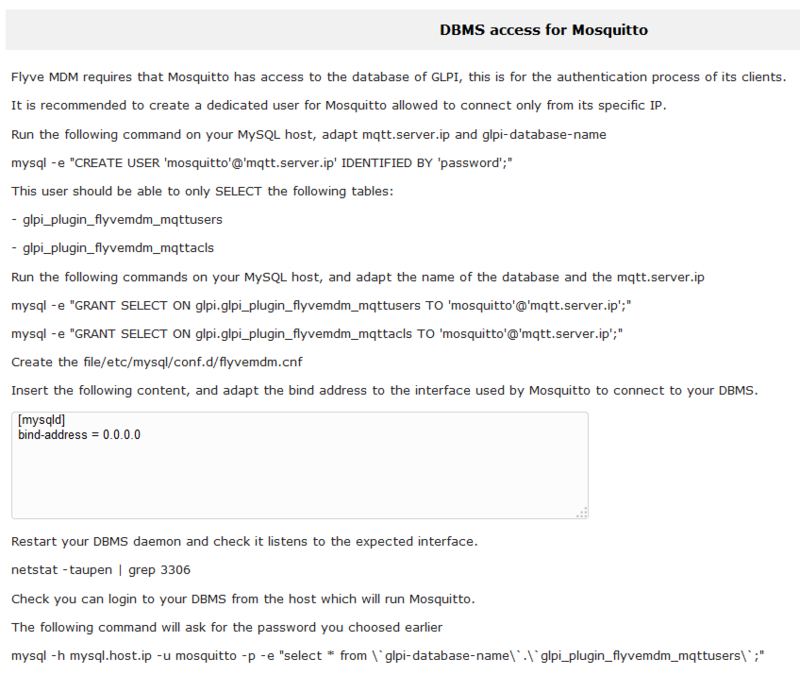 Recreate the mariadb user with mosquitto@localhost instead of mosquitto@mqtt.server.ip. 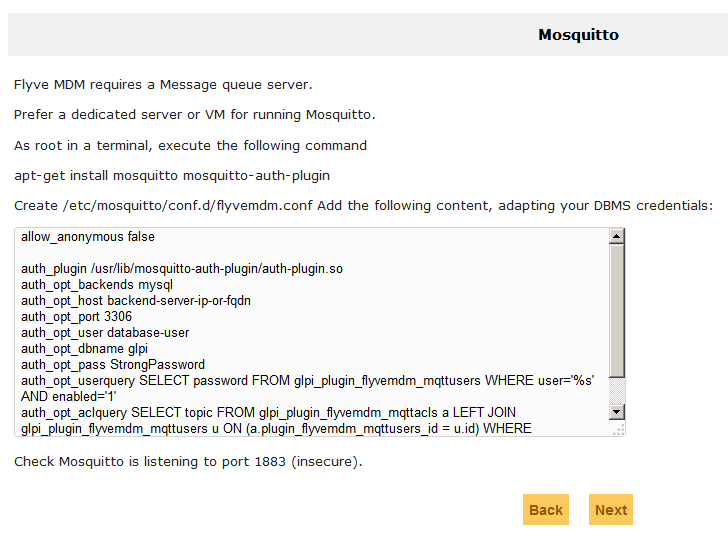 Recreate the mariadb user with mosquitto@localhost instead of mosquitto@mqtt.server.ip . mysql102 -e "CREATE USER 'mosquitto'@'localhost' IDENTIFIED BY 'MyPassWord';"
mysql102 -e "GRANT SELECT ON glpi.glpi_plugin_flyvemdm_mqttusers TO 'mosquitto'@'localhost';"
mysql102 -e "GRANT SELECT ON glpi.glpi_plugin_flyvemdm_mqttacls TO 'mosquitto'@'localhost';"
mysql102 -h localhost -u mosquitto -p -e "select * from \`glpi\`.\`glpi_plugin_flyvemdm_mqttusers\`;"
I’d replace apt-get with yum and give it a try.